From toothpick sculptures to hammer-and-nail portraits, a surprising number of artists use remarkably conventional materials as the basis for their offbeat masterpieces. Sometimes the results are inspiring and other times they seem to border on kitsch. Still, art from ordinary objects can provide an interesting reminder that the things around us we take for granted can be repurposed in ways most of us might never think of. Also, as any artist knows, a new material can mean new aesthetic possibilities and unique material-dependent expressions. 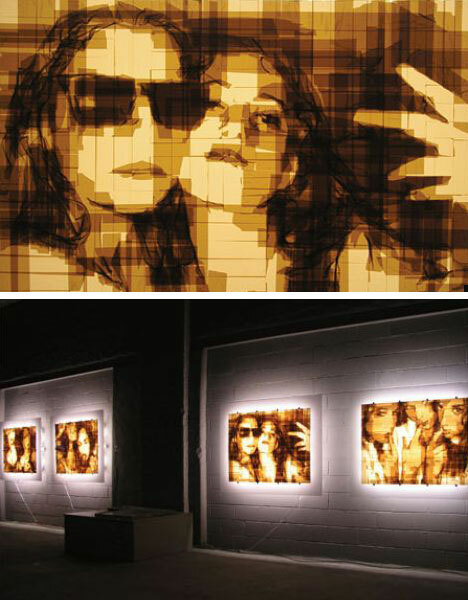 The packing tape art of Mark Khaisman demonstrates that even the most mundane material can be the basis of a complex and rich composition. 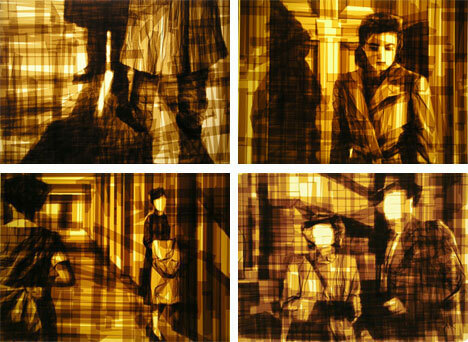 Comprised entirely of brown tones and illuminated from behind, there is something vaguely film noir about some of his more scenographic works. In other pieces he takes ordinarily colorful snapshot scenes or classic portraits and renders them unfamiliar and abstract. Originally from the Ukraine Mark now lives, works and has regular shows in Philadelphia, PA. 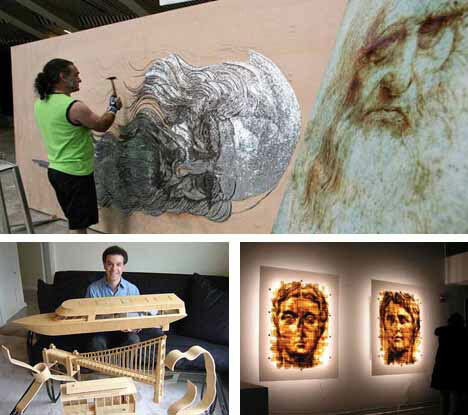 Artist Saimir Strati holds world records both for the largest toothpick mosaic and largest nail mosaic in the world. 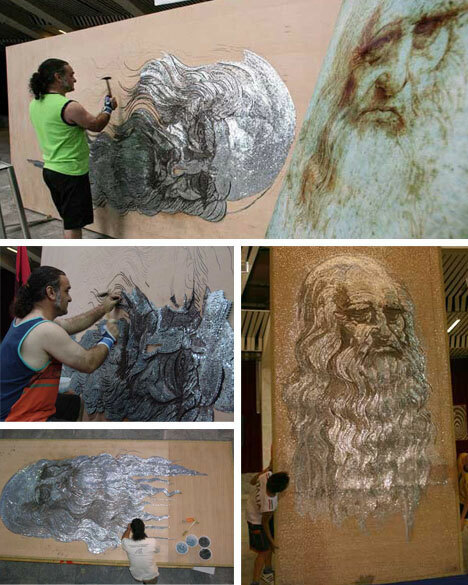 The above work shows Leonardo da Vinci using tens of thousands of individual nails set at different heights and angles to create subtle differences in tone and reflectivity. His toothpick mosaic features over 1.5 million individual toothpicks. Aside from these record-setting creations he also paints colorful and abstract landscapes and composes fantastical mosaic scenes in more conventional materials like tiles. There are a lot of artists in San Francisco, so having a day named after him is no small feat for woodworker Steven Backman who has been constructing toothpick models for over 30 years. 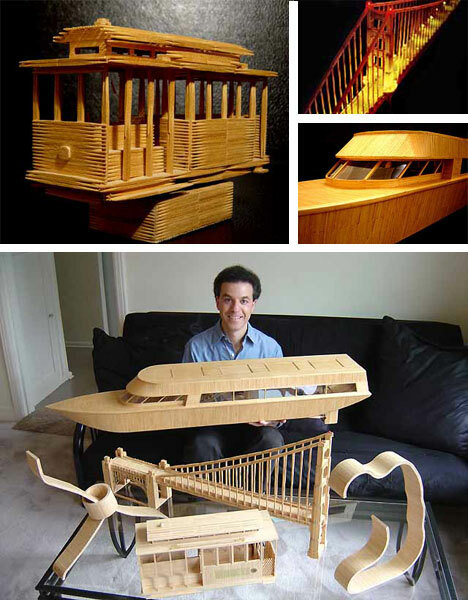 His works range from an impressive thirteen foot replica of the Golden Gate Bridge to a rather cutesy musical rotating model of a San Francisco street car (that plays “I Left My Heart in San Francisco” as it spins). On top of being an impressive scale model, the yacht shown above actually floats and works as a remote-control boat.